Using genetically engineered mouse models and high-throughput screening technologies, MSK researchers have found a surprising new approach for targeting glioblastoma. It involves focusing in on cancer stem cells. The type of brain tumor known as glioblastoma (GBM) is one of the most difficult cancers to treat. Complete removal by surgery is impossible because of where and how these tumors infiltrate brain tissue. 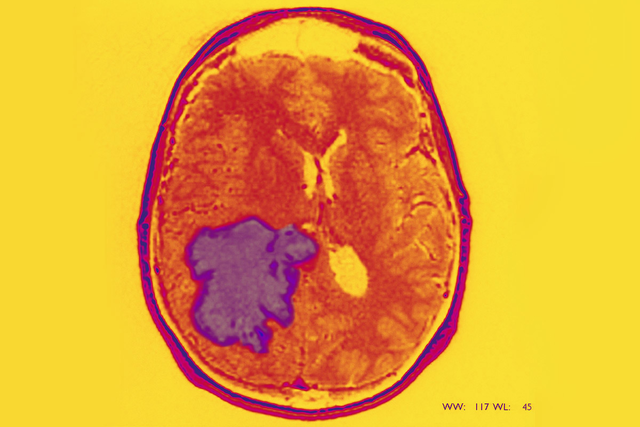 Additionally, the most commonly used treatments for glioblastoma — radiation therapy and the chemotherapy drug temozolomide (Temodar®) — are not very effective over the long term. 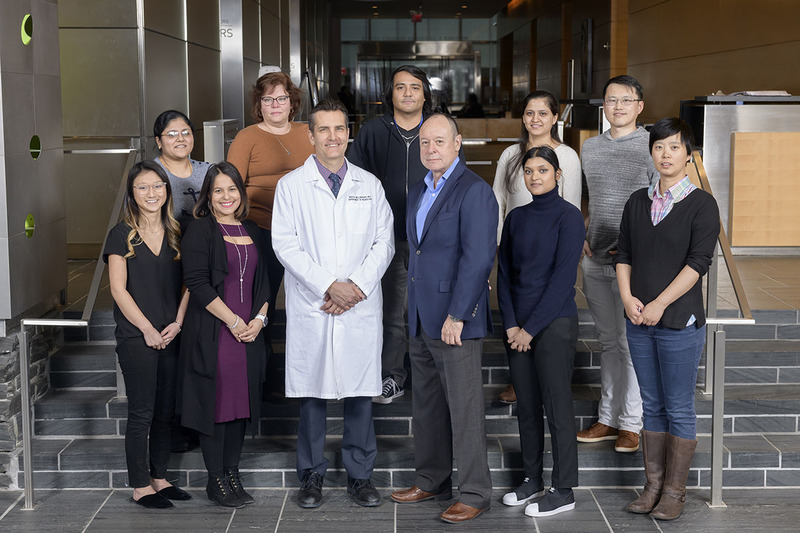 Researchers in Memorial Sloan Kettering’s Brain Tumor Center, led by developmental biologist Luis F. Parada, are focused on finding more effective ways of attacking this deadly cancer. In a study published in Nature, they report on the identification of a compound that kills glioblastoma cells using a mechanism that’s completely different from earlier treatments. The scientists say one of the keys to finding better drugs is developing models that accurately reflect the cells that make up these tumors. Memorial Sloan Kettering’s Brain Tumor Center brings together scientists and clinicians with the goal of developing truly effective brain tumor therapies. Like normal stem cells, cancer stem cells can give rise to many other types of cells. This means they have the ability to rebuild a tumor, even after most of it has been removed, leading to cancer relapse and metastasis. “The pharmaceutical industry has traditionally used established cancer cell lines to screen for new drugs, but these cell lines don’t always reflect how cancer behaves in the body,” explains Dr. Parada, whose lab is in the Sloan Kettering Institute’s Cancer Biology and Genetics Program. Cell lines are idiosyncratic populations derived from a single cancer cell that are grown in the lab. “The therapies that are currently in use were designed to target cells that are rapidly dividing,” he adds. “But what we’ve concluded in our studies is that glioblastoma stem cells divide relatively slowly within tumors, leaving them unaffected by these treatments.” Even if most of the tumor is destroyed, the stem cells allow it to regrow. Glioblastoma is driven primarily by a small number of gene mutations, including three genes that have been used to model the tumor in mice. The investigators in Dr. Parada’s lab demonstrated that when mice were engineered to carry these three mutations, 100% of them developed glioblastoma. Next they pooled the cells from the mouse-derived tumors. Their hope was that this population of cells would be more accurate than traditional cell lines in reflecting the range of cell types making up a typical glioblastoma tumor. With these cells in hand, the team was ready to use them to begin looking for new drugs. What they sought were compounds that could kill glioblastoma tumor cells, including cancer stem cells, without killing normally dividing cells. Using high-throughput screening, a method in which hundreds of thousands of compounds can be evaluated in a single test, the list of potential drugs was whittled from 200,000 to 5,000 to 2,000 to 60. More in-depth studies were conducted on the 60 most promising compounds. The treatments traditionally used to treat glioblastoma are not very effective over the long term. One drug — which the team eventually dubbed Gboxin, short for “glioblastoma toxin” — rose to the top. It was effective at curbing the growth of glioblastoma tumors in mice and did not seem to make them sick. After the researchers showed that Gboxin was effective at treating glioblastoma in mice and killing human glioblastoma cells, they set out to determine how and why it worked. Through a series of complex experiments, they made an unexpected discovery: that Gboxin killed cancer stem cells by affecting a specific component of their metabolism and starving them of energy. Several labs at MSK study the metabolism of cancer cells, including those of MSK President and CEO Craig Thompson and Sloan Kettering Institute cell biologist Lydia Finley. But until now, this hasn’t been a focus of Dr. Parada’s work. Specifically, the researchers found that Gboxin prevents cells from making ATP — the cell’s energy currency — by way of a process called oxidative phosphorylation. This highly efficient process of metabolism takes place in structures called mitochondria, sometimes referred to as a cell’s energy factories. Other dividing cells in the body, including other cancer cells, rely less on oxidative phosphorylation than stem cells. They employ instead a type of metabolism called glycolysis, which is better at generating the building materials required to make new cells. This makes them much less sensitive to Gboxin. When Gboxin accumulates within cancer stem cells, it essentially strangles the mitochondria and shuts energy production down. There is still a lot of work to be done before Gboxin can be tested in clinical trials in humans. Among the next steps, the investigators need to determine that Gboxin will be able to cross what is called the blood-brain barrier. If it can’t, a version that is able to do so will need to be developed. Much more research is needed on the potential side effects of the drug as well. Investigators from the University of Texas Southwestern Medical Center also contributed to this paper. This research was funded by National Cancer Institute Grants R35: CA210100 and R01: CA131313. It was also funded by a Basic Research Fellowship from the American Brain Tumor Association (in memory of Theodore Sapper), William H. and Alice Goodwin and the Commonwealth Foundation for Cancer Research, the Center for Experimental Therapeutics at MSK, the Cancer Prevention and Research Institute of Texas, and the Robert A. Welch Foundation. Dr. Parada served as consultant for Bio-Thera Pharmaceuticals from 2013–2018. He is a coauthor on the patent application ‘Substituted Benzimidazolium, Pyrido-Imidazolium, or Pyrazino-Imidazolium Compounds as Chemotherapeutic Agents’ (international application no. PCT/US2016/065751, pub. no. WO/2017/100525 (2017)). Wow this is famtastic, i have Glioblastoma and go to MSKCC for treatmemt biweekly. Would volunteer for this trial if/when it becomes available, although i am a trial now, and am doing ok. Bless your whole team. Dear Marc, it is still too early to know when — or if — this compound will ever be tested in human trials. We’re glad to hear you’re doing OK with your current trial at MSK. Thank you for your comment and best wishes to you. Would this type of treatment help someone with Glisarcoma? My mother in law was diagnosed with Gliosarcoma in January 2019. Dear Elizabeth, we’re sorry to hear about your mother-in-law’s diagnosis. It is still too early to what types of cancer it may be effective against, if it ever makes it to clinical trials. If your mother-in-law interested in learning about trials that are currently available at MSK, she can make an appointment online or call 800-525-2225 to learn more. Thank you for your comment and best wishes to you and your family. How can we find out more about the study? When will the human trial begin? How can we be in contact with the study to put our name on the list for human trial? Dear Angie, it is still too early to know when — or if — this compound will ever be tested in human trials. If you or someone you know is interested in learning about trials that are currently available at MSK, you can make an appointment online or call 800-525-2225 to learn more. Thank you for your comment and best wishes to you. My 32 year old son has GBM4. He was diagnosed 7 years 5 months ago and at the moment is doing well. The cancer has been stable for over 6 years. I’m keen to learn about research. Dear Sharon, we’re sorry to hear about your son’s diagnosis, but glad to hear he is doing well. Thank you for your comment and best wishes to both of you. My son's favorite teacher died of GBM almost 30 years ago. He is 39 sadly, has GBM himself. Why has nothing changed in 30 years for treatment or cure for GBM? Why has a cure for HIV been found and not cancer? Why is SOC the only "cure" offered and that is only to treat...not cure. I just don't understand....someone please explain to this hurting mother and all that have a loved one with cancer. Thank you. Dear Donna, we are very sorry to hear about your son’s diagnosis. You may be interested in joining Connections, our online support group for people with cancer and their family members. Best wishes to you and your son. Dear Andrea, we’re very sorry to hear about your husband’s diagnosis. Although the drug discussed in this article is still in very early stages of development in the laboratory, we do have other clinical trials for glioblastoma. if your husband would like to come to MSK in New York for a consultation, you can make an appointment online or call 800-525-2225. If he is not able to travel here we recommend that you discuss with his current care team whether any clinical trials are available. Would you please explain why the drug has to be able to pass through the blood-brain barrier? Is it so it can be administered without direct "injection" into the tumor, or does it have to do with something else? Dear Marie, this drug is still in the very early stages of development and it is still too early to know whether it will ultimately be effective and, if so, how it will be administered. Thank you for your comment. My nephew, 38 year old active Army veteran , who served in Iraq, has been dx with Glioblastoma stage 4. Any help/guidance/ recommendations would be appreciated! Dear Donna, we’re very sorry to hear about your nephew’s diagnosis. If he is interested in coming to MSK for a consultation he can make an appointment online or call 800-525-2225. Thank you for your comment and best wishes to you and your family. My Husband had GBM surgery at MSK January 31, 2017 and passed away September 27, 2017. How is it possible for people to live for many years with GBM while the survival rate is only up to 15 months? Dear Stella, we are very sorry for your loss. The 15-month figure is an average, which means that some people will live longer. Thank you for your comment and best wishes to you. I am 61 years old andIt will be two years on April 29th 2019 since I had a seizure from my GBM tumor. It was surgically removed and I did Temadar and radiation. It came back in an inoperable area and I had high energy focused radiation as well as having Avastin IV treatment. In about a month I will have another MRI to see how effective this has been. Not many places do trials with GBM once it reoccurs, but I am holding out hope that the drug in this article, or any other treatment for that matter, will become available. Consider me a volunteer if needed. Dear Jim, thank you for sharing your experiences. If you are interested in speaking with someone at MSK about what treatment options may be available, including participating in a trial, you can make an appointment online or call 800-525-2225. Best wishes to you.